This bookshelf is an update of an Arts and Crafts design built by the Roycrofters in the early twentieth century. I updated it by using warm, colorful woods, and simplifying the design to accentuate its tapered shape. 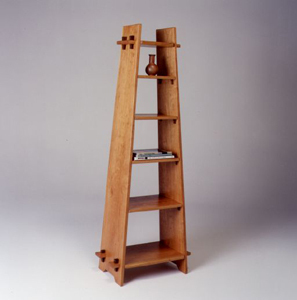 This bookshelf appeared in an article in the New York Times in 1994 and was sold through Felissimo in New York City and The Gardener in Berkeley, California. It also inspired Niall Barrett to create one of his own, which is featured in the book Bookcases. The detail below is for a similar bookshelf made of hard maple and planchonia woods.